In every life there are moments that put one’s faith to the test. How do we react when the circumstances of life do not match our view of how life should be? Fortunately, the Bible is full of the examples of those who faced faith-testing moments and found God faithful and discovered that the tests are necessary for true spiritual development. Pastor Jesse Waggoner shares a series of messages taken from these biblical stories. 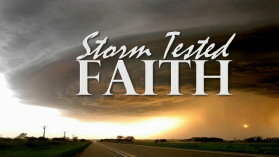 Come and find encouragement in your faith-testing moments and learn how to have a storm-tested faith! Pastor Waggoner teaches us why we can go to Jesus in our storms. We learn the differences between our own view of our usefulness and God’s view of our usefulness.